From the Serengeti to the Ngorongoro Crater, here we come. Today was our drive day as we moved from our camp in the Serengeti to our new home high on the rim of the Ngorongoro Crater (7,800 feet). About half way to the Nobi Gate we ran into a huge line of wildebeets and zebras that had to extend for several miles, as it seemed to never end. With the line on the move, they provided us with some wonderful panning opportunities. Continuing our drive to the Crater, we arrived at my favorite Maasai village for an insight into the Maasai way of life. After visiting with the Maasai, I arranged for an impromptu portrait session with several of the warriors and women. If I recall the details correctly, they were ready to arrange a low cost marriage for me. Something like 200 cows would get me a Maasai bride – I took a pass. Tomorrow will be another early rise - off to the spend the day in the Ngorongoro Crater. Blogging live from the Ngorongoro Crater. Today we rose to heavy overcast skies and with two of my clients off to a balloon ride over the Serengeti, the rest of us headed for the central area of the Serengeti. More lions in trees and more lions in trees. The wildebeests and zebras have moved into the plains near our camp in full force. Following some landscape work on the way back to camp, it was an early return as we started prepping for another early morning departure and head for our new home high on the ridge line of the Ngorongoro Crater. As I write this, a storm has moved in complete with thunder and distant lightening. I always love falling to sleep under the skies of the Serengeti with rain hitting the roof of the tent. What a way to end the day. Oh yes, we celebrated one couple's 48th anniversary tonight with a special song and dance from the crew. 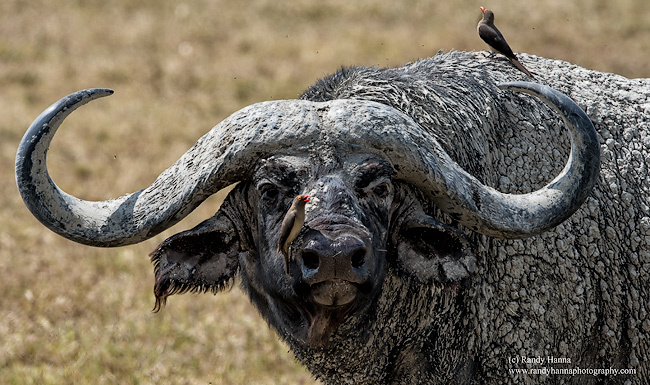 Classic touch from the Thomson Safari Serengeti Crew. Thanks guys, you made the night very special for two lovely folks. While working the border between Tanzania and Kenya, I started photographing this bull that separated himself from the main herd. Using a telephoto to compress the distance a bit gave me the added safety distance that I needed. All in a days work I guess. While leading a photo safari for Thomson Safaris, our group followed this large male leopard for nearly an hour has he walked through the tall grass and the undergrowth in the Serengeti. While tracking him, we observed what we thought was a limp from time to time as he walked. After passing up numerous trees, he finally found one that he considered suitable and up he went. Once he took up his perch, we could see a recent wound on the right leg. Thankfully the wound appeared to healing.